Nintendo has always been very protective when it comes to their franchises, especially when it comes to fan made projects, honoring works of the past, or offering a continuation of a series that has been shoved aside for many years. Nintendo is pretty much the little child when it comes to the latter, as they are quite known to sue everyone that does something with one of their beloved franchises, even when it’s just a free fan project, offering free publicity. That being said, it seems Nintendo has been opening up, allowing other publishers to do something with a few of their franchises, with Hyrule Warriors being the best example for the Wii U. 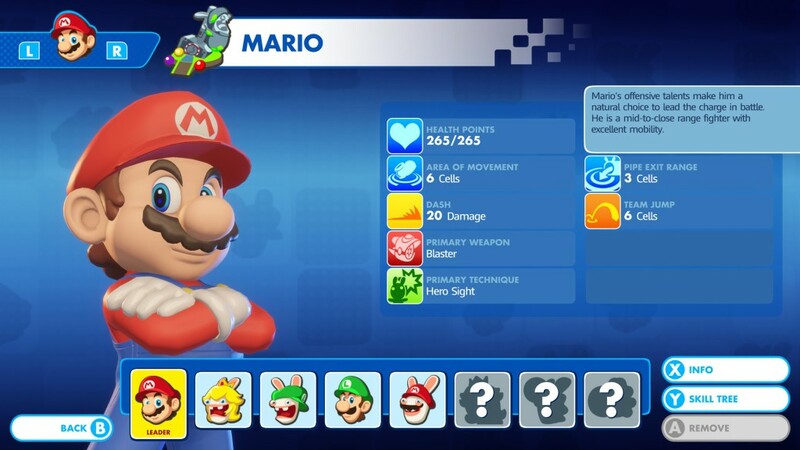 This time around Ubisoft is allowed to play with the biggest Nintendo character ever, Mario, in a spin-off involving the Rabbids, one of Ubisoft’s most original and wackiest creations. We weren’t sure what to expect of a crossover of the Mushroom Kingdom and the crazy Rabbids, in a tactical cover based strategy game. All we know is that we loved it. The Rabbids are quite known to be very mischievous creatures who can’t be serious for more than a few seconds at a time. When they end up with their ‘Time Washing Machine’ in the basement of a young inventor who created a helmet that can merge two items, you just know things will go wrong in a matter of seconds. 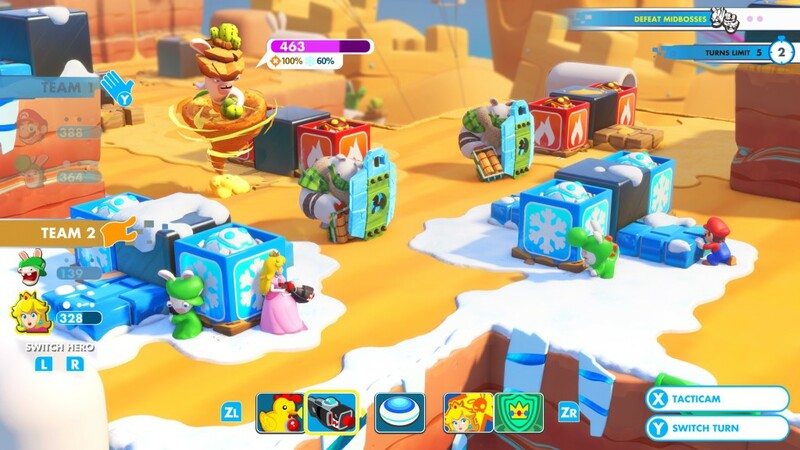 When one of the Rabbids takes an interest in the device, he starts blasting it all over the place, combining items with one another, and even Rabbids with adorable Mario costumes, creating a Peach and Mario Rabbid variant. 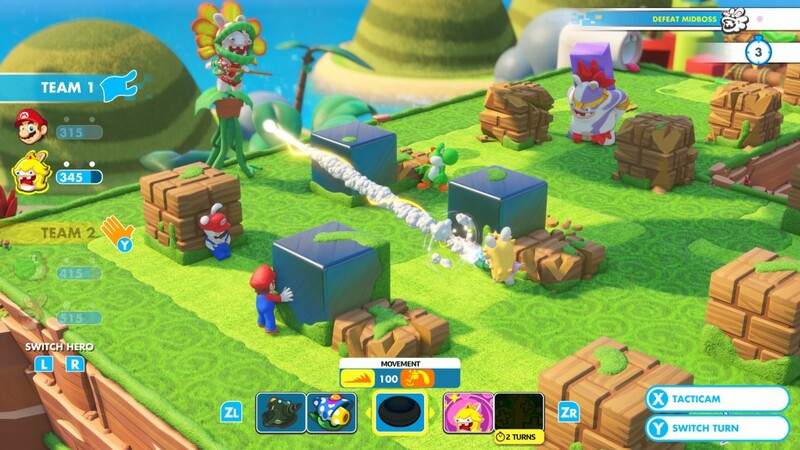 After a few minutes they zap back into their machine, which creates a vortex to the Mushroom Kingdom, which is the start of a new adventure for Mario and his friends, as one of the Rabbids merged with the helmet and is now uncontrollably creating new monsters, creations and odd combinations all over the Mushroom Kingdom. 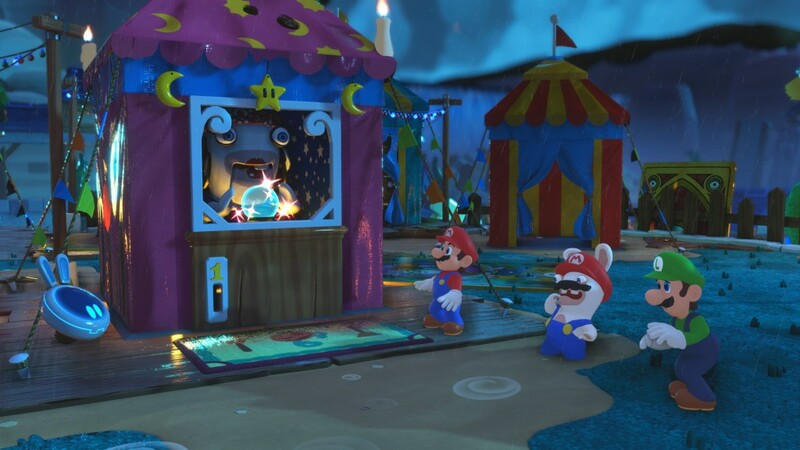 From here on out it’s a partnership between the Rabbids with Mario themed costumes, and the heroes we know and love from the Mushroom Kingdom, as Bowser Jr. also has taken an interest in ‘Spawny’ the Rabbid with the merging device. Overall the story doesn’t really progress that fast, and it is told in a very lighthearted fashion with hilarious cutscenes and small dialogue screens. The developers did a great job in making the game feel like a real Mario title, although with many influences of Ubisoft’s Rabbids. 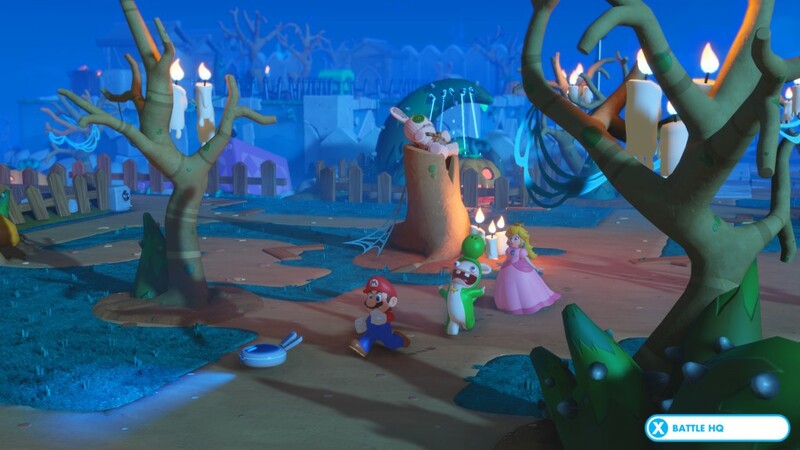 Graphically Mario + Rabbids: Kingdom Battle is pretty much what you’d expect of a Mario game, as it’s extremely colorful, it respects the themes of the different worlds of the Mario universe, and there’s an overall lightness in the vibrant world that makes it very appealing. Of course, the universe is perfectly suited for Ubisoft’s minions as well, and overall the game is a beautiful combination of two different franchises making a very picturesque whole. There isn’t a single moment that the game does not feel like a Mario game, safe for the gameplay mechanics, which are more reminiscent of a lighthearted XCOM game. The sound design of this game is pretty much perfect, as it’s once again the best of both worlds. You’ll get some reworked upbeat Mario tunes, in combination with the ludicrous screams of the Rabbids, which sound extremely funny. Overall things have been handled with care, once again respecting both series to the letter, but making it a bit modernized, which perfectly suits the game. Sadly there is no real voice acting in the game, which would have been rather nice, but then again, you can’t really stick an actual voice on many of Nintendo’s beloved characters. 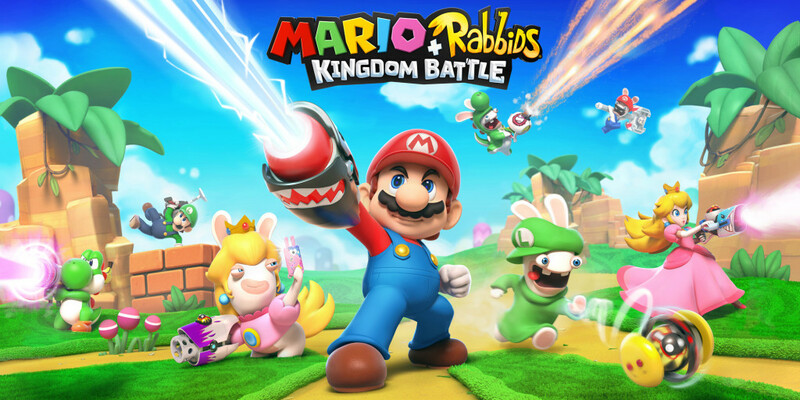 Mario + Rabbids: Kingdom Battle is a cover based, turn based tactical game, which involves giving firearms to Nintendo’s beloved Mario Bros characters, pretty much shaking the foundations of every Mario game ever made. This means you’ll be roaming through worlds, with combat that’s somewhat similar of an XCOM game, thus tactical, not really that fast paced, and somewhat tricky if you want to reach the best possible rank per stage. The game itself is divided into different worlds, each with nine stages, ten if you count the secret stage that you can unlock. Nonetheless, each of said stages involves some free roaming around in the part of the world you’re in, as well as one or more battles you’ll have to force your way through if you successfully want to reach the ending of said stage. Only after all the battles in a stage are complete your characters will be fully healed, but there are sometimes healing items to be found in the intermezzo pieces between battles, or you can simply switch characters for the upcoming fight(s), safe for Mario, who will always be your team’s captain. Fights always follow the same turn based battle, but the objectives differ a little, ranging from killing all enemies, downing a specific amount of baddies, escorting another character to a goal area, or reaching said goal area with one of your own characters. Last but not least there are also boss battles, which all have a certain quirk to make things a bit more difficult. Just like in XCOM, cover is an important aspect in combat, which means you can simply stand in the open as an easy target, hide behind low walls, reducing your hit rate with 50% and last but not least find high cover, blocking 100% of damage. Most cover can be destroyed, thus moving around is the key, especially seeing your enemies will not be downgraded to sitting ducks either. Most of the time they’ll try to outmaneuver you, and hit you from an exposed spot, so it is vital you try to do the same. You’ll always get to move within a specific range, use one special skill and fire your primary or secondary weapon, not specifically in that order. Things get interesting, when you learn new skills, improve your passive abilities and work together with your other three characters, as they can toss you further, allow you to do slide-attacks and so on. Keep in mind that you’re limited to three active characters per battle, while your opponents may use many more than yourself. The game offers a lot of different weapons, and many different approaches to combat thanks to the diversity of the characters. While some have similar weapons, their skills are very different, or their secondary weapons are completely different. The game will offer you a decent amount of cash to keep upgrading your arsenal, but it is advised to replay battles in order to achieve the highest rank possible, as the payout will be a lot bigger, allowing you to keep your entire crew up to date. Sadly you can’t farm levels, as once you complete them, the cash you’ve earned is something that you can’t earn again, safe for getting a better rank, which will unlock a higher amount, until you’ve reached the best rank that is. Puzzles in-between stages are fairly simple, and you’ll never really have a hard time progressing, safe for retrying a few battles. That being said, there’s enough replay value, as some parts of the worlds are locked until you unlock certain skills, like moving around big blocks, picking up statues, and so on. There’s enough to collect in terms of collectibles, weapons and upgrade orbs, the latter being necessary to unlock skills for your characters. Mario + Rabbids: Kingdom Battle is sublime in everything it tries to achieve. You’ll get a great strategy title, with a fun storyline, a lighthearted theme and a fun and enchanting soundtrack to grant you a decent amount of hours of fun. The game is rather short compared to other games in similar genres, but this makes sure the game never dulls down, and the added replay value is certainly a plus as the game entices you to continue playing and replaying certain levels in order to unlock more items for your characters. Overall a great, balanced and perfectly designed crossover between two different franchises. This is one of those titles that puts the Switch on the map.